Geocashing. Does it sound like a great road trip with kids adventure? Many families on the road enjoy this active, travel based hobby. Learn how your family can join the geocashe game. You have either heard of geocashing or you do not have a clue what it is or both. The ultimate game of hide and seek is about to be explained so that you can have a great time when you decide to play. Geocaching is the perfect activity if you are on a road trip with kids. It will keep them occupied and they will have loads of fun as well as learning a few things. The key to geocashing is finding geocaches, which are containers that are hidden in the great outdoors. This is a world-wide game and at the present there are 1,051,774 geocaches hidden throughout the world. This is why it is the perfect treasure hunting game if you are on a road trip with kids. You are already traveling and when you put your zip code in after registering to play, you will be directed to a list of geocaches hidden in your area. Everyone can geocashe including families, friends and people of any age group. The more people participating, the more fun they have. If your 84 year old grandma wants to geocache, there is no reason she cannot. Of course, when choosing the difficulty and the terrain rating, she should keep in mind the rural areas are more difficult to navigate, but on the other hand she might be more agile than you are. Since geocashing is a world-wide game, the areas are quite diverse. The caches can be hidden within an urban area or they may be in the mountains. It can be played in any state and any area. Remember the treasures located near you are found by putting in your zip code. This is what makes it such a great game to play if you are on a road trip with kids. Does it Require a Lot of Equipment? The terrific thing about geocaching is all that it requires is a GPS device, a computer and Internet access. For those who will be in areas such as trails in the woods, it is a good idea to carry extra clothes, food and water as well as a compass and a map. These extra items might prevent you from getting lost, especially the compass. Remember to keep track of where you parked. 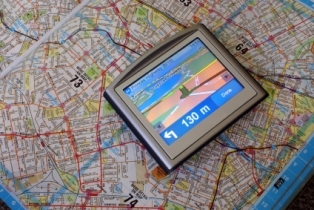 The GPS device you purchase does not have to be state of the art. One with a basemap feature is usually recommended and does not add much to the price of the device. The GPS device should be compatible with your computer and it is a good idea to have an external antenna for areas where signals may be weaker. At the least you should purchase a GPS that is water resistant. Water proof is even better. There are some GPS devices being sold today that are designed with geocaching in mind. How Can I Find Out More about Geocaching? You are already excited about geocashing and want to know more. Simply go to the site that will explain all the details Geocashing.com. They have tons of information as well as resources on geocashing and even forums to share information such as the best GPS devices. The site is where you register to become a member and find a geocache hidden near you. Geocaching is catching on all across the nation because it is a terrific game that allows you to experience the adventure of going to new places and learning about the world around you. Supporting the environment and joining the 3 to 4 million geocachers worldwide promotes a sense of community that has increased dramatically. The perfect activity when you are on a road trip with kids, geocaching will teach them many things about nature, directions, protecting the environment and it is fun too. What Kind of Treasures Will I Find? This is what makes it so much fun. You never know what type of item someone will have left. They could be valuable and if you take whatever is in the cache you must leave something of equal or greater value in return. There are geocoins and Groundspeak Trackables that are sometimes left. They placed on items and the owner gives the trackable a place they want it to end up. You can help by taking it to another cache along the way where someone else can pick it up and so on until it eventually gets where it was intended to go. Geocaching has an appeal to everyone, but RV families on the road are especially attracted to this thrilling game. They can do this practically anywhere they are in the country. This makes fun activity for the whole family. It does not require a lot of space for equipment. A GPS device is small and a laptop computer does not take much space at all. 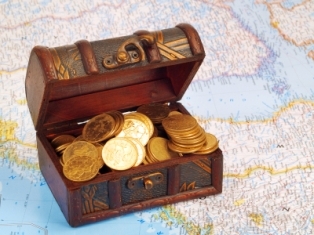 It is a world-wide treasure hunt and everyone loves a treasure hunt.